'Tis the season for apple picking. Or, if (ahem) you're in denial about that certain season, and also about the veryveryimminent life changes you're anticipating, you might spend Sunday mornings gallivanting around the farmers' market in all-too-summery yoga clothes, enjoying the sun and stocking up on way too many "second" apples at 99 cents a pound. It's basically just like apple picking, only lazier. Either way, you wind up with a fridge full of apples, and a sinking sensation that what looked like such an amazing bargain! is now a very real item on the to-do list: make apple stuff. Oh, it's on your to-do list also? Welcome to the club. 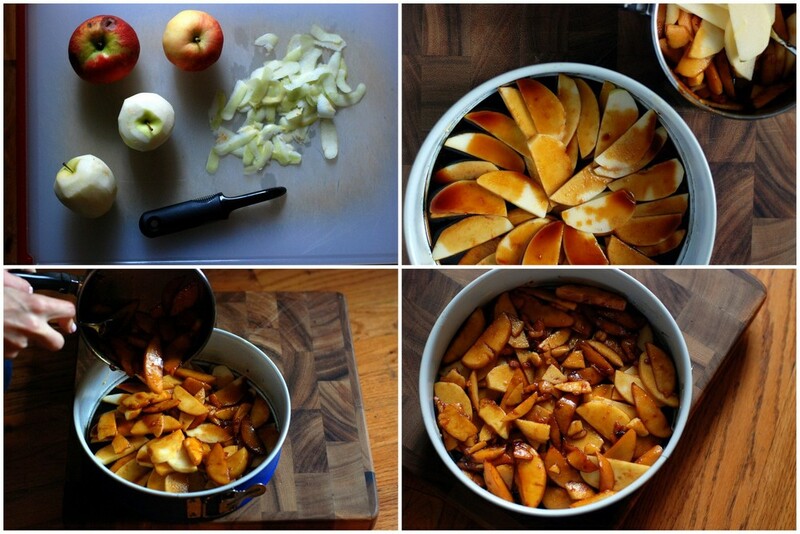 So here's one "apple stuff" for you to make this weekend. An upside-down upside-down cake, where the upside-down bit is left right where it started. Can we call it a right-side up cake? Good. Don't worry: there's caramel involved. And the cake part isn't anything to scoff at, either: it's a beautifully feathery, well-spiced gingerbread that I can see baking up on its own in a loaf pan and serving with tea. Do you have beautiful, burnished, spot-free apples? Great: save them for fancy company. This is a cake in which your 99-cent seconds can hide their blemishes and find a happy home. The brown spots don't matter. Heck, it doesn't even matter what kind of apples you use. I had two golden delicious and two honeycrisps with plenty of spots in the drawer, and they worked great. About the whole right-side up thing, because I know you're wondering: I get that it takes a rather peculiar disposition to go seek out a recipe for upside-down cake, then insist on serving it right-side up. I'd like to take credit for some creativity (or hey, peculiarity) but in truth, it all happened by accident. I put the apples in a pretty pattern, intending to display them when serving. I drizzled the caramel carefully and made a really beautiful cake bottom, but then the thing came out of the oven and I remembered that I really like crust. Judging by how many bakeries sell muffin tops these days, I'm guessing many of you do, too. And the top of this cake is a really good one, not unlike the crust of a good muffin, that I hesitated to give up just to show off its underbelly. Taste over beauty any day. Plus, if you ask me, this cake is still quite the looker, even if it's less inclined to flaunt the goods. I made this in a 9-inch pan, instead of the 10-inch called for in the original recipe. While the baking time was much longer, I liked the taller cake and the (seemingly) more feathery crumb. Your choice; I've included instructions for both. But if you can avoid it at all, don't use a springform pan. I did, and I ended up having to wrap the outside in foil to help stop the caramel from leaking out. 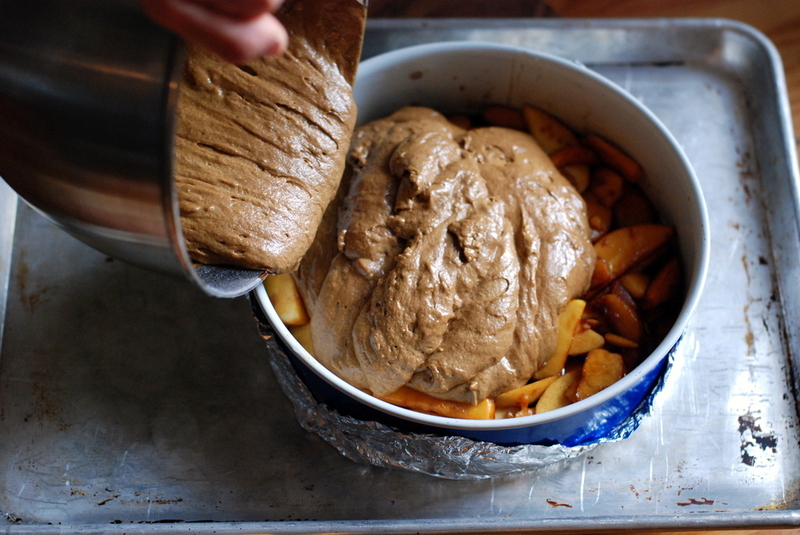 If you decide to flip this cake upside-down after all, your apples will fare better if you cut them in wedges. I sliced mine more thinly, which made for a great underside, but the wedges will stay firmer. Make the topping: Preheat oven to 325 degrees F. Grease a (non-springform) 9- or 10-inch round pan. Heat butter in a small saucepan over medium heat. When butter has melted, add brown sugar, stir to combine, and simmer for four minutes, until deep brown, bubbly, and very fragrant. Add the salt and remove from the heat. Drizzle half the caramel into the bottom of your cake pan. Then layer the apple slices into the cake pan in a circular pattern, and drizzle the remaining caramel overtop. Make the batter: Using a stand or electric mixer, blend butter and sugar until light and fluffy, about 2 minutes. 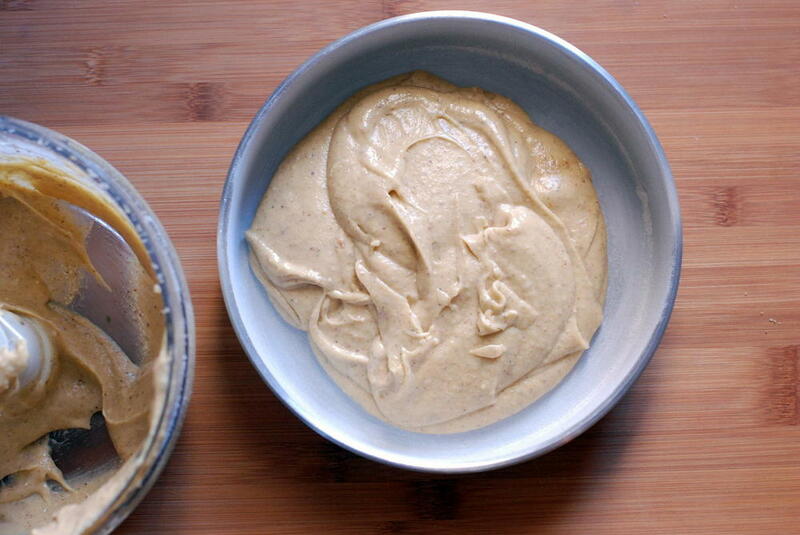 Combine egg, molasses, honey, and buttermilk in one bowl, and the dry ingredients in another. Then, with the mixer on low speed, alternate adding wet and dry ingredients to the butter mixture, making sure to end with the dry ingredients. Pour the batter into the pan over the apples. For a 10-inch pan, bake for 45-50 minutes; for a 9-inch pan, bake 60-70 minutes (mine took the full 70), until a toothpick inserted into the center of the cake comes out clean. Cool the cake on a rack for 10 or 15 minutes, then either serve warm, or carefully flip onto a rimmed platter. I served this plain, but Deb and Karen Bates both recommend softly whipped cream. It certainly can't hurt. According to my big stack o' food magazines, Thankgiving is the day for pie, and the December holidays are prime-time for cookies. Since there's no formal season for cakes, we'll eat them all year and call it even. Fair? Early spring brunches bring rhubarb coffee cake; summer calls for double-decker strawberry cake; and I've got a slew of French-style no-biggie cakes, peasant and pound, to finish off just about any meal. But when winter can't seem to let go, I want something toasty and comforting, something simple and relatively unadorned. The days are so short that I can't really motivate to make something sky-high and celebratory - plus, after dinners of thick lentil soup and rib-sticking stews, I want a desert to finish things off without overdoing it. When I first came upon this walnut cake, it was quite the opposite of "not overdoing it:" a towering thing, with piles (I'm serious, piles) of jam, and a big, fluffy cloud of tangy whipped cream gilding the lily. The thing was tasty, but it was so done up, it had almost nothing to do with the cake at the center of it all. In my world, the solution to all not-quite perfect recipes is to add chocolate. And so, armed with my best Valrhona, I baked the original cake, slit it in half, painted a thin layer of jam in the middle, smacked the two halves backed together, and cloaked them in chocolate ganache. In my world, this sounds like the cake of dreams -- only it wasn't. It was dense, cluttered, and, quite truthfully, unpleasant to eat. Womp. And so it was that I attempted time #3. I ditched the fancy springform and pulled out my most trustworthy, least fussy square baking pan. I ditched the Valrhona (don't tell on me) and I even ditched the jam. Back to basics: It felt a bit like wiping off the makeup from a stage performer. My instincts were right: the cake was drop-dead gorgeous au natural. Toasty and warm, nutty but also plenty buttery, absolutely perfect with a cup of tea. That's how we ate it, morning and afternoon, until it was all gone. Did I mention it comes together in one bowl (a food processor bowl, but still) in no time at all? Just as it should be. Where I live, the snow is still coming down. That means there'll be another pan full of this cake, and lots of hot water for tea. It's the little things that make me feel lucky these days. This is one of them. Notes: You can make this cake in either a round pan or a square one. Make sure it's an 8-inch pan, though: a 9-inch pan will give you a thin cake that's a bit less satisfying to eat. If you must fuss, mix 1/2 cup of whipped cream with 2 tablespoons sour cream and a tablespoon of sugar. The tangy whipped cream, in small doses, compliments the cake without overpowering it. Preheat oven to 350° with a rack in the middle of the oven. Butter and flour an 8-inch square or round cake pan. Spread walnuts in a single layer on an ungreased, unlined sheet pan. Toast for 10-15 minutes, until nuts are tinted slightly and smell very fragrant. Watch carefully: you want to take the nuts into golden-brown territory but if you burn them, you'll need to start over. Pulse walnuts and sugar in a food processor until finely chopped. Add butter and process until combined, then add eggs and vanilla and process until combined. Add flour, baking powder, and salt and pulse just until incorporated. Spread batter in cake pan. Cake keeps, well-wrapped, at room temperature for up to 4 days. Snacking cakes and I go way, way back. Our long history revolves mostly around languid summer Saturday afternoons, when lunch has long passed but dinner seems far away. Company is still over, we're all sitting around a table, there are crumbs everywhere and half-empty cups of ice coffee with mostly-melted ice dribbling down the sides. But trust, there is snacking cake. 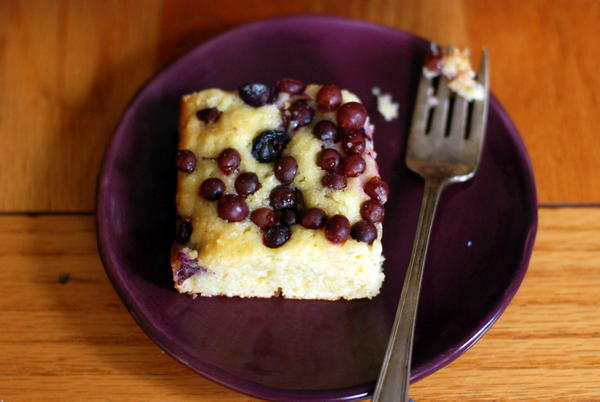 Summer has faded into fall, but that hasn't stopped snacking cake from sticking around. I happened upon this specimen, plump with concord grapes, when looking for my usual focaccia recipe. Fortunately, with so many different kinds of grapes at the market, my eyes were bigger than my stomach, and I bought them all. That left me with enough for two focaccias plus this cake. Right upfront, let me tell you that this cake bears a striking resemblance to cornbread. 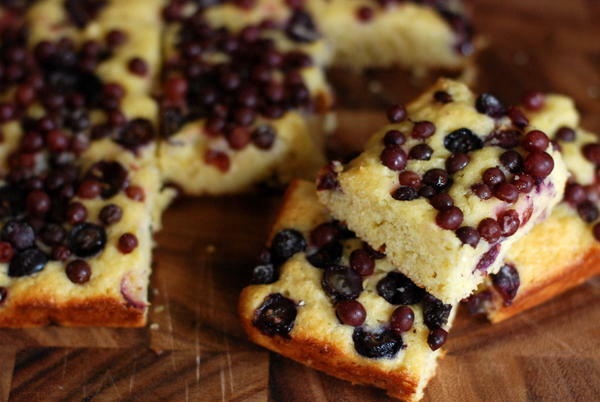 (If that's not your jam, perhaps you'll love this other snacking cake, my personal favorite.) It isn't cornbread, per se: it's a bit lighter and, well, cakier than your typical cornbread. But the genius touch here is the honey, which gets drizzled in but not fully mixed. The result is a thin thread of sweetness throughout the cake. The grapes on top also are key: they add some very important moisture, and when you bake the thing, they get plump and just shy of jammy. Another honest moment: this cake is best when it's just out of the oven. If you're planning to bake it in advance, you'll be far more enamored if you tuck it into the oven for one last spin before serving. You want those grapes warm, that crust crisp and steaming. Now that it's fall, languid Saturday afternoons have plenty of room for a warm, toasty snacking cake. I made only minor adjustments to this recipe, mostly to indulge my preference for butter in pretty much anything. The recipe originally called for 4 T oil and 2 T butter, but I made it with all butter. If you're more of an oil cake girl, go right ahead. Either way, it's a no-mixer recipe. Aren't those the best? I will also confess to using a mix of Thomcord and Champagne grapes, those lovely hybrids with good flavor but no seeds. Concords have superior flavor, but as I sit there with a paring knife picking out each of the FOUR seeds from each grape, I get rather stabby and swear never to use them again. This time, I put my money where my mouth was, and I was much happier to eat the cake as a result. 1/2 cup plus 2 tablespoons flour 1/2 cup cornmeal 1 teaspoon baking powder 1/2 teaspoon kosher salt 2 large eggs 1/2 cup sugar 1 teaspoon lemon zest 1/2 teaspoon vanilla extract 6 tablespoons melted butter (or use 1/4 vegetable oil and 2 tablespoons butter) 6 tablespoons buttermilk (or substitute milk plus juice from half a lemon) 2 tablespoons honey 1/2 a pound of grapes - Thomcord, Concord, Champagne, whatever you've got. But definitely red or black. De-seeded, if necessary. Preheat oven to 350°. Butter an 8-inch square baking dish. Whisk flour, cornmeal, baking powder, and salt in a medium bowl; set aside. In a separate large bowl, whisk together eggs and sugar until smooth and satiny. Add lemon zest and vanilla and whisk to combine. Add butter and/or oil; whisk to blend. Whisk in flour mixture, then buttermilk. The drizzle in honey, and use a knife to swirl it into the cake without fully incorporating it. Pour batter into prepared dish, and scatter half the grapes over cake batter. Bake until cake turns light golden brown around the edges and starts to set, 15 minutes. Remove from oven and scatter remaining grapes over cake. Continue to bake until top is golden brown and cake springs back when pressed, 20-25 minutes longer. Transfer to a wire rack. Let cool slightly in pan. Serve warm.